The Lib Dems have been warned by their advisers that they are at risk of losing all 11 of their MEPs in next month's EU elections. Leaked briefing documents say that coming out of the elections with no MEPs is a realistic option. One Lib Dem told the Telegraph the idea of them losing all their MEPs was "nonsense" but another said "it is looking like an absolute bloodbath". Lib Dem President, Tim Farron, seems to be resigned to the fact that the party is going to be wiped out in the EU elections. 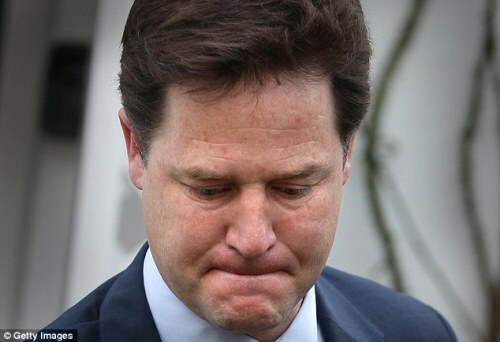 On an entirely unrelated note, we've just discovered a Tumblr site devoted to pictures of Nick Clegg Looking Sad complete with humorous captions. Sadly it hasn't been updated for a year but perhaps the look on his face as their MEP gradually drops down to zero will inspire the author to revive it.